خادم‌پیر, مصطفی, روشندل کاهو, امین, نجاتی کلاته, علی. (773). تجزیه طیفی با استفاده از روش وارون‌سازی کمترین مربعات مقید شده. مجله ژئوفیزیک ایران, 8(4), -. مصطفی خادم‌پیر; امین روشندل کاهو; علی نجاتی کلاته. "تجزیه طیفی با استفاده از روش وارون‌سازی کمترین مربعات مقید شده". مجله ژئوفیزیک ایران, 8, 4, 773, -. خادم‌پیر, مصطفی, روشندل کاهو, امین, نجاتی کلاته, علی. (773). 'تجزیه طیفی با استفاده از روش وارون‌سازی کمترین مربعات مقید شده', مجله ژئوفیزیک ایران, 8(4), pp. -. خادم‌پیر, مصطفی, روشندل کاهو, امین, نجاتی کلاته, علی. تجزیه طیفی با استفاده از روش وارون‌سازی کمترین مربعات مقید شده. 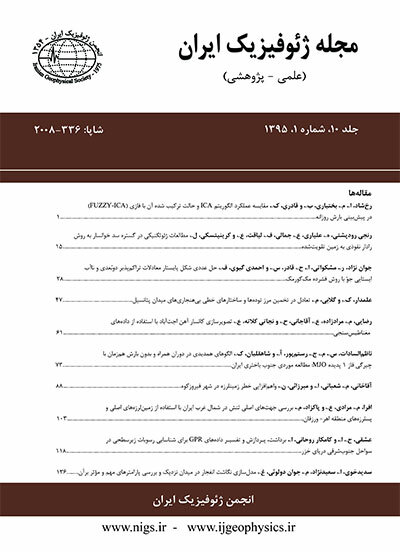 مجله ژئوفیزیک ایران, 773; 8(4): -. تجزیهطیفیداده‌هایلرزه‌ایبا کمک تبدیل‌های زمان-بسامد،دامنه‌هایلرزه‌ایراکهتابعیاززمانومکانهستندبهمقادیر طیفیکهتابع بسامد،زمانومکانهستند،تبدیلمی‌کننداین ابزاردر زمینه‌های گوناگون مانند تعیینضخامتلایه، نمایش رخساره‌هایچینه‌ای،توصیف مشخصاتمخزنواکتشاف مستقیم منابعهیدروکربن کاربرد دارد. کاملاً واضح است که هرچه تفکیک زمانی و بسامدی در صفحه زمان‌–بسامد بیشتر باشد، رخدادها را می‌‌توان بهتر جداسازی کرد. در این مقاله از الگوریتمی مبتنی بر روش وارون‌سازی کمترین مربعات مقید شده CLSSA، برای محاسبه طیف زمان-بسامد استفاده شده است که دارای توان تفکیک بیشتری نسبت به روش‌های دیگر، ازجمله تبدیل فوریه زمان کوتاه است. کارایی این روش تجزیه طیفی روی داده‌های مصنوعی مورد بررسی قرار گرفت و با نتایج تبدیل فوریه زمان کوتاه مقایسه شد. همچنین از این روش برای آشکارسازی سایه‌های بسامد کم مربوط به مخازن گازی، در یکی از میدان‌های گاز شمال ایران استفاده شده است. Since the earth acts as a low-pass filter, it changes frequency content of passing seismic waves. Therefore, the seismic data are non-stationary signals. Due to the non-stationary property of seismic data, spectral decomposition based on Fourier transform cannot reveal the appropriate characteristics of them. It cannot show changes of frequency content of the seismic signal with respect to time. Since, the spectral components of a non-stationary signal are functions of time, a simultaneous representation of time and frequency will be very useful for the analysis of such signals. Time-frequency transform upgrades the spectral decomposition to a new step and can show time and frequency information simultaneously. Spectral analysis of seismic data using time â frequency transforms, converts the seismic amplitudes, which are a function of space and time, to spectral values, which are a function of frequency, time and space. Nowadays, the time-frequency transforms have been widely used in the seismic data processing and interpretations. They can be used in estimation of layer thickness, reservoir characterization and exploration, estimation of absorption coefficient, burial channel detection, random and coherent noise attenuation and, etc. The time-frequency distribution can be computed by various methods, each of which has their advantages and disadvantages.Short-time Fourier transform (STFT) is one of the conventional spectral decomposition methods. The STFT spectrum is obtained as the Fourier transform of various windows of signal with various time centers. The windowed form of Fourier transform and the Heisenberg uncertainty principle affects the resolution of time and frequency in the STFT spectrum. According to this principle, the time and frequency resolution of the STFT spectrum cannot be simultaneously increased. Various methods have been introduced to simultaneously increase the time and frequency resolution in an STFT spectrum. Fourier transform can be written as a matrix equation. In the case of underdetermined inverse problems, there are numerous solutions for the matrix equation of Fourier transform. The least squares solution is one of the many available solutions which is the smoothest solution. Daubechies et al. (2008) introduced an algorithm that obtains a sparse solution for an inverse problem using the constrained least squares method. This method is an iterative algorithm. We can improve the resolution of STFT spectrum by replacing the conventional Fourier transform with the mentioned algorithm. The efficiency of this method is evaluated by applying to both synthetic and real seismic data. The results of the synthetic example showed that the constrained least squares spectral analysis (CLSSA) had a better resolution than the conventional STFT method. We used the CLSSA to illuminate the low-frequency shadow corresponding to a gas reservoir at one of the gas fields in the South-West of Iran. The results of the real data example showed that the CLSSA has a much better resolution than the STFT.